At present, Canadians are of the belief that the political class has sunk so far beyond redemption that little of importance remains in the Senate. That's an illusion, and deserves some further thought and reflection. While there are non-trivial problems within the Canadian senate, it still serves a purpose. Interior of Canadian Parliament Building of Canadian Senate chambers in Ottawa, Ontario. I realize that these next few posts will open up a torrent of criticisms, but it is perhaps good to consider what are some of the positive and progressive aspects of the Canadian Senate. Despite the difficulty, there is perhaps no better time to come to its defense than when it remains so universally under assault. Writer Saul Bellow used to say that, "A great deal of intelligence can be invested in ignorance when the need for illusion is deep." At present, Canadians are of the belief that the political class has sunk so far beyond redemption that little of importance remains in the Senate. That's an illusion, and deserves some further thought and reflection. Our full democratic franchise is constitutionally built around three founding institutions that exercise approval for legislation -- Senate, House of Commons, and the Crown, as represented by the Governor-General. 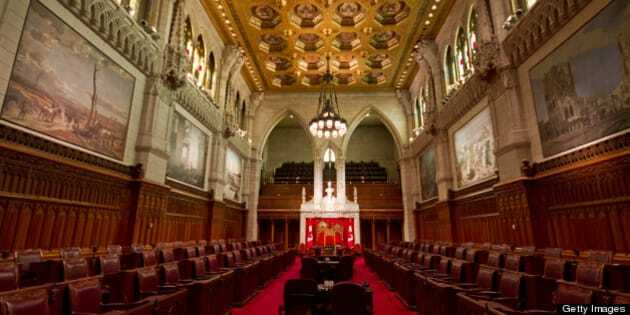 The Canadian system provides a chamber of "sober second thought" (the Senate), as a means of reviewing proposed legislation to ensure its effectiveness and correct any oversights. In my time as a Member of Parliament, bills that were sent to the Senate for approval were occasionally returned for fine-tuning or larger overhaul if flaws were discovered. That's the gist of it. Traditionally, relations between the two chambers in the House have been amicable and mutually effective at passing legislative proposals that had been put through their paces. It's what Canadians would expect from a sound democratic process and historically it has been much envied by a multitude of nations around the world. But it's now in trouble -- the entire process, that is. Vocal opponents of all three institutions desire to completely overhaul the elected House of Commons and perhaps do away with both the Senate and Crown approval. This could be a costly mistake. The present operation in the House of Commons is unquestionably ineffective. For all its potential it has been seriously hobbled by a kind of rank partisanship so devoid of respect and compromise as to resemble a battlefield instead of a chamber of high thought, reasonable arguments, and consensual outcomes. Seasoned veterans, both political and in the public service, whisper quietly that they have never seen it so bad. It's a damning observation, mostly deserved. But what if that were all there was? Given the reality that open warfare now exists between the parties, what effect would that have on the laws that are passed? We don't have to look too deeply to find out -- billions of dollars expended through vast omnibus bills meant to conceal specific issues, billions incurred in debts and deficits through a kind of spending that can't balance the books, or the vast expanse of the Prime Minister's Office beyond any sense of proportion (a habitual habit of a number of recent governments). And then there are those things that can't get done -- the censure of the right of individual MPs to put forward motions, the withholding of data from the Speaker (contempt of the House) or investigative heads, and the inability of parties to cooperate on the vital issues of climate change, unemployment, or Canadian international influence. In a word, the House of Commons, with its elected members, has clearly entered the realm of dysfunction. This is something we all know and grouse about. So, what if there were no checks or balances on such conduct? It would be a legislative shambles, constructed upon hyper-partisanship and winner-takes-all outcomes. The world's most successful nations have established balancing institutions that can help to offset poor legislation or the tyranny of the majority and blind power. To possess a Senate that isn't elected but appointed through merit is perhaps the best way to keep runaway power or partisanship from overrunning a nation. But as anyone reading these words will observe, that's not what we're getting. For some time Senate appointees have often been party cronies who assisted a government in getting elected. Especially in recent years, new legislatures have, in the words of Globe and Mail writer Jeffrey Simpson, been more "salesmen" than "statesmen." Through improper governance we have permitted the Senate to take on the same rank partisanship as the House of Commons. The answer to that problem, however, is not to abolish but reform it through merit. In the next few posts we'll consider what that might look like if we can break away from our illusions.